Hello, Friends! Ralph finished up his sibling Christmas gifts this weekend. 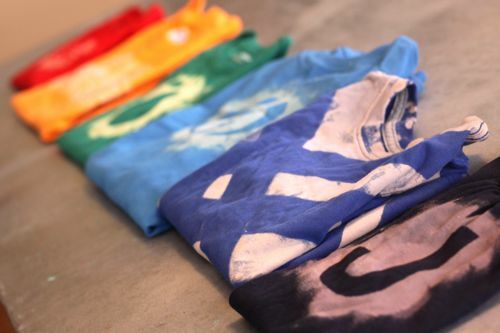 He created great-looking bleached out tees, each one unique and representing something he thought each individual sibling would love. They turned out super cool. And I’ve got the images and techniques ready to share. Find the full DIY below. For Betty, Ralph chose a simplified flower. Cute! This one’s for Maude. 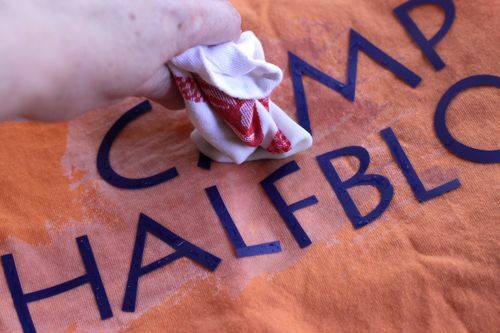 In case you’re wondering, orange Camp Halfblood t-shirts are a major part of the Percy Jackson book series. : ) Ralph made a second one for Maude’s best friend. Maude is going to go nuts over these. Olive’s favorite color is green and her favorite fruit is a pear. Ralph made a t-shirt for himself too. He is really into skate brands at the moment, so he recreated the Electric logo. For Oscar, Ralph used duct tape. Ralph’s happiest about how this one turned out. J is for June, of course. 1) Start by gathering your materials. You’ll need a 100% cotton t-shirt in a bright or dark color (you can use a pastel, but the contrast from the bleach won’t be as intense), bleach, rags and something to block the bleach. We used vinyl cutouts and duct tape as blockers. 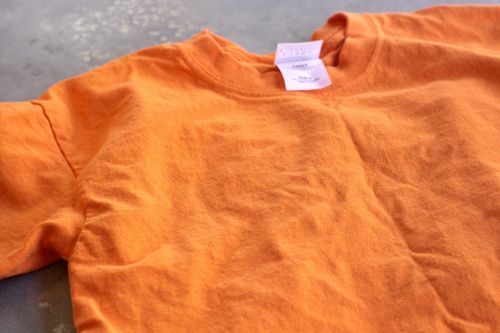 2) Spread out the t-shirt, then put a layer of rags or an old towel between the front and back — so the bleach doesn’t bleed through to the back of the shirt. 3) Apply the design you want on your t-shirt. For most of our designs, we used sticky-back vinyl that was cut into shapes and letters using a Silhouette machine. For Oscar’s tee, Ralph put strips of duct tape across the shirt in a diagonal pattern. If you don’t have a Silhouette machine, you could still buy a sheet or roll of sticky-back vinyl and cut out the shapes you want by hand. 4) Next, pour some bleach into a container and dip an old rag into the bleach. Press the rag on to and around the vinyl or tape. 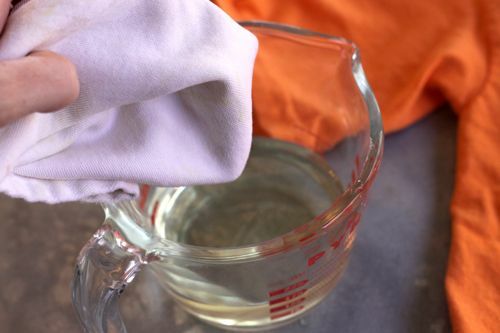 When the shirt is as bleached as you’d like it to be, life the front of the shirt, slip out the rags and immediately rinse the shirt in water to stop the bleaching process. – If the bleach doesn’t seem to be working, there is probably sizing on the t-shirt fabric. Just wash and dry the shirt and try again. This happened to me twice and washing the shirt did the trick. – Wider pieces of vinyl seemed to work better than thin pieces. 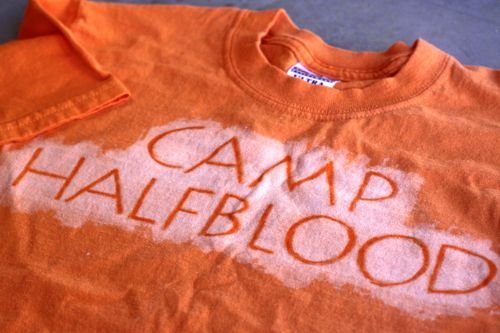 For example, the lettering on the Camp Halfblood t-shirt was super thin and the bleach crept behind the letters. 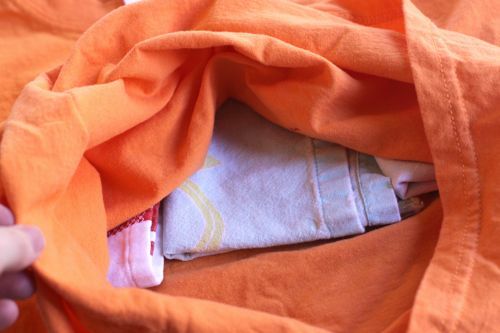 We used an orange fabric marker to correct any over-bleaching. 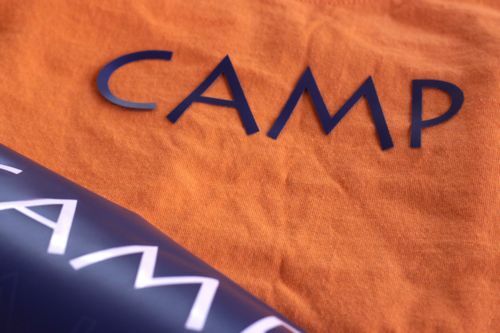 The camp tee was the only design where this happened. – For the pear we used a sponge brush instead of the rag. The rag makes for cleaner edges around the design. The brush made fuzzy edges. Both can be cool depending on what you’re looking for. Need more sibling gift ideas? We made several fun projects this year: Monogram Mugs, Bottlecap Magnets, Custom Leather Patches and Photo Snowglobes. You can also find a list of projects from past Christmases here. Love this idea — the kids are going to look great in them! Way to go Ralph! those are really cute. I’ll have to file this one away for when my kids are a little older. thanks for sharing. I love this but would LOVE some ideas on how to beef up all white shirts. I have a ton of those. sweet! these are great for everyone. He should be so proud!! These shirts look awesome. What a GREAT idea! How awesome! Love it and now I have one more project to add to my enormous list – thanks Ralph! Yes! No kids are allowed to read my blog for a month before Christmas. Luckily, everyone likes surprises so they cooperate willingly. This is also true when we’re making the actual gifts. We’ll ask everyone else to go watch a movie or play outside while one of the kids and I work on gifts. No one ever complains — they know they’ll get a turn too. good question. I was wondering the same thing. These are beautiful Gabi. I love the duct tape one. I can’t wait to go to Hawaii next week. Christian’s mom is crazy about tie-dye and I’m sure we’ll make a bunch. Love this! I look here every year for ideas! These are beautiful! Excellent idea. I’m going to try it this weekend. So wonderful! I love that they are so personalized. Another tip – you can use a spray bottle for a more misty look. And don’t forget BE PATIENT! Don’t over apply the bleach. Sometimes it looks like it’s not “working” and then all of a sudden everything goes crazy. Thanks for this tip- I’m on here reading this while we try it and I was just thinking that it didn’t look like it was working as well as I’d like- but I guess we just need to be patient and wait and see. I did wash mine first to make sure they would work. LOVE THIS IDEA!! Ralph did an awesome job! Love the ideas he chose for each sibling. What a cool idea! I have a ton of ideas now – thanks!!! What a great idea to do with or for kids (big or little)! Brilliant idea!! WOW. My kids would LOVE the striped shirt. Ralph did such a great job! I’m sure his siblings are going to love them and look amazing in them too. Such thoughtful gifts! Super cool indeed! Oh, your children are so lucky to have you (and each other AND all the uber cool sibling gifts, of course…)! :o) :o) :o) I’m going to keep the instructions for my son who will start making his sibling gifts once his sibling arrives next May. :-) Thank you!!! Such a great idea! I love how your kids make their gifts for each other. What a cool project! I wonder how much fun it would be to experiment with technique and tools. How about using a spray bottle for some of it? I just might have to try it! Thanks for the inspiration! 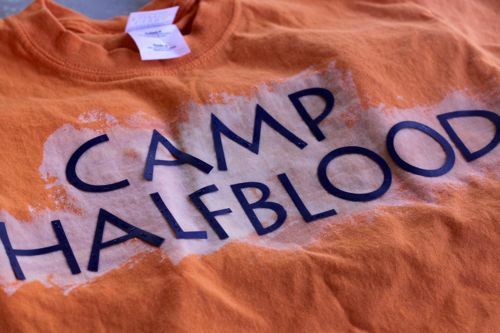 These look awesome, and I love the “Camp Halfblood” shirt in particular! These turned out great! Very creative. Nice job, Ralph! Ashley Ann had a tutorial on bleach art t-shirts earlier this year. She and her boys used spray bottles (or was it water guns?) and had the shirts hanging out on a clothes line. The spray creates a neat affect too. I’m wondering if you could use freezer paper stencils instead of sticky vinyl? (I’m always trying to use the craft supplies I already have in the house!) These look great! this is really a good idea. i’m thinking back to some things that i ruined with bleach that i may have been able to turn into something great. as always…thank you for sharing our great ideas! You have an awesome family. So many incredible memories being made. I love how your kids make each other gifts every year. They always do such a great job. Thanks for sharing their ideas! I’ll have to say these are really cool. I am not much for DIY projects, but I might consider some T-shirts. Love all these projects…would love to know where you get all the ideas from! Please can I come have Christmas at your house? These sibling presents are so amazing! My oh my this is such a great idea! I wish you had posted it sooner since all my Christmas gifts are done. Next year, for sure! 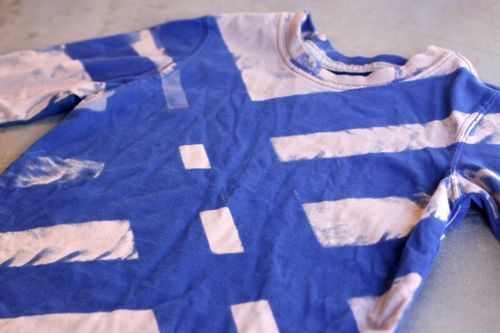 I saw two people mention ways that we create these T-shirts with our Girl Scout troop – we use freezer paper to make the stencils (iron it onto the shirt) and we spray the bleach on with a spray bottle. I’m going to have one of my kids make these T-shirts for her sisters this year. We’ve only made them in Scouts with words and a few simple shapes. I love the idea of one simple shape. Fun! LOVE this idea – – great for teacher gifts too! I see your kids having a little side business here! Awesome work! 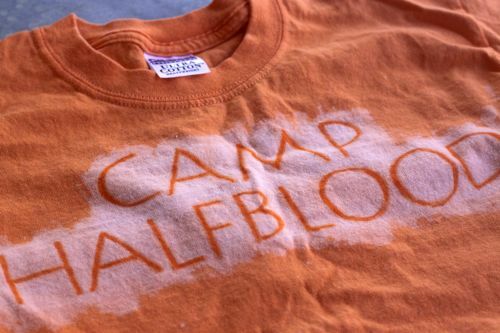 My daughter is drooling over that Camp Halfblood shirt too – what a great idea! I have the same question as Melissa@Halfbaked – do you think it would work with freezer paper stencils? It seems like it would . . . I think my boys are going to be old enough next year to do this, and the kids will have such a ball making gifts for each other! eek! in my earlier comment i meant to say thank you for sharing YOUR great ideas. sorry about the typo. Great job Ralph!! The sibs will surely love them! These shirts look amazing! Excellent work! And I love the way your T-shirts look to begin with. Did you wash them in something special first? They have a very pretty vintagey look. Thanks for this idea — can’t wait to try it out! I think Ralph needs to set up an etsy shop! What a fantastic idea!! They look very classy – dare I say it, not ‘craft project DIY present from a sibling’ at all (that’s a good thing). And I think Ralph must be pretty cool – I love the name (it was my Grandpa’s name), he makes presents for his siblings AND the presents he makes are cool. Way to go Ralph! OK, so you have completely inspired me to do homemade gifts going forward between my three children. What a great, fun idea! Love them. Thanks for always inspiring all of us. Love! Dan is doing t-shirts too! I love this idea! Something a little different than tie dye but still super simple. Yes, it’s like the opposite of tie dye. Both are so fun for kids! I’ve done this with a spray bottle – fun effects either way! You always provide the greatest ideas. 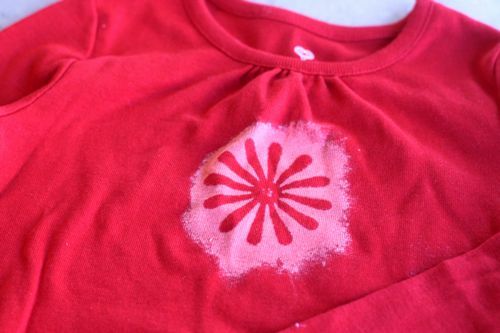 This summer my daughter and her best friend did some potato print painting on t-shirts. They had so much fun and I appreciate how affordable it was. I am SO Impressed! Love all the colors, designs and ideas! Can you do this on totes and other cotton items? I’m sure it would work equally well on pretty much any 100% cotton item. I’d recommend testing an inside seam first. 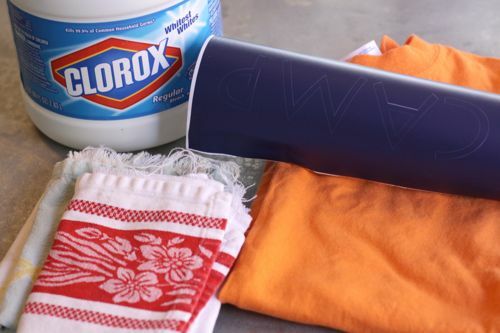 Something like a tote might be chemically treated to repel water — which means it would also repel bleach. What a great idea! Love it! And I love all of your kids’ names. What a great collection of timeless favorites! Olive was at the top of our list…I think my hubby still kind of wishes we’d gone with that…it was his favorite. And how special to make gifts for each other. I will keep this in the back of my mind for when mine are a little older. I’ve just remembered that I think I wanted all your kids do it themselves gifts for myself last year too. I love the pear tshirt, would wear and might just make one for myself! These look awesome! Definitely something we will have fun with! My roomies in college did something like this on hoodies, I forgot about it until now. Hi Melanie! You’re in luck with the washing. As you as you’ve rinsed the bleach out when you’re making the tee, the bleaching process stops. Then you can launder them with related colors as usual. I LOVE this idea. I have a maternity shirt that got bleach splattered on it after just two wearings and I haven’t had the heart to throw a good shirt away. Now I can just put a design on it and make it look like it was on purpose! Thanks! These are so awesome! Can’t wait to try this tutorial! I love this idea…my bleachings are always accidental! I think Ralph must be the best big brother in the world! He even made one for Maude’s best friend – so thoughtful! Ralph Rocks – you’ve done well, Gabby! Wow, a friend just sent me the link to your blog and I’m hooked – line and sinker! As a stay-at-home mom who does freelance graphic design on the side, I can relate to your story and I’m lovin’ your style. Bravo! 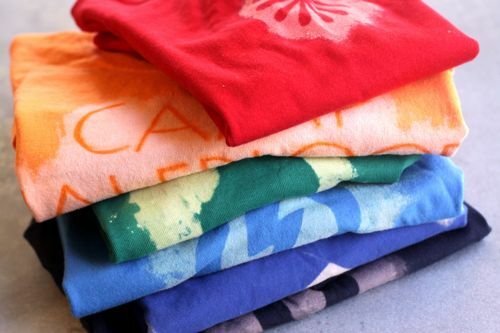 Sorry if someone asked already – but where did you find solid color tees in so many colors? I am having a horrible time finding solid color tees in 2T-4T (that aren’t white)…but I am not giving up yet. any suggestions? I know this question was asked a year ago, but for anyone else looking, try American Apparel! Am I the only one who had problems with this? The bleach crept under my vinyl letters, even though they were thick. Maybe I used too much bleach? This is such a definite! I can’t wait to see the face on my little 10 year-old girl skater’s face! I don’t live in the States so I can’t get the fancy supplies but I think I can do a Foundation skateboards logo with just duct tape. Thank you for this fantastic idea! Cute idea! I once used an old Aqua Doodle pen filled with bleach and drew a design onto a shirt, it looked so pretty when done. Thank you for the inspiration. I just had my kids (5, 5, and 4) make a couple of shirts using this method for their father for Christmas. They look awesome. I can’t wait for him to see them! I ran across this posting before Christmas and being on a VERY tight budget this year, I KNEW I had to give this a try. I found my shirts at Michaels, and the 12 month at Walmart in the kids section. Cut 4-wheelers with a saying for the boys and pretty butterflies for my niece out of contact paper I had on hand with a Cricut. Had SO much fun doing this with a friend. Only had problems with one, and my niece LOVED it anyway. THANKS for the wonderful idea and tutorial. 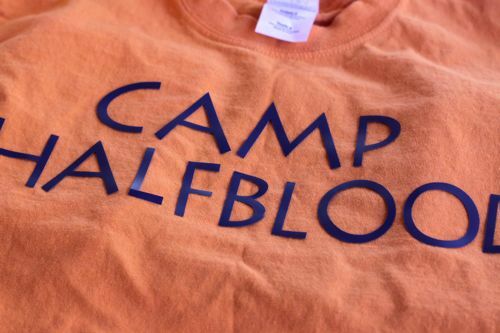 Can you please tell me what font you used for the Camp Half Blood shirts? My son saw these and wants to make them for he and his best friend (who happens to be moving soon). I’ve tried to locate font myself but nothing is looking quite right. Thanks!!!! Does anyone know – would it work if you tie-dye shirts and then bleach on top of the tie-dye? I have a camo tie-dye in mind and then bleaching on an image or wording for my son’s scout troop. Would love any input. We just finished making shirts for Christmas gifts! I love this. 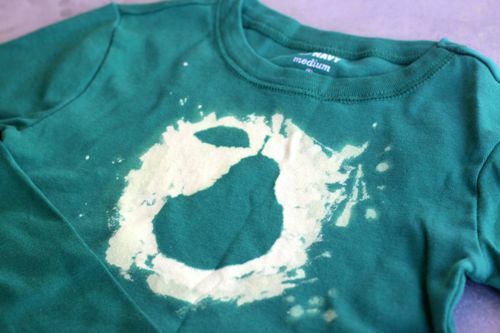 I was actually thinking this would be a great summer project and an awesome way to recycle the tees the kids have gotten those little oily stains on. I want to try to do a fairy design for my daughter and drum sticks for my son…. Where do you get the cute colored t-shirts?? Love them!! Have you tried using rubber stamps? Wonder what we could use as ‘resist’ that bleach wouldn’t bleed through. Perhaps a water based glue that would wash out after the bleaching process was complete. Just finished making these as Hanukah for my nieces and nephews. I actually recommend not washing them first. Having the sizing on there to give you a lot more control even though it takes longer for the color to fade. My first (pre-washed) batch was a complete fail because the bleach so quickly seeped right under the vinyl designs. thanks for another great idea Gabby! 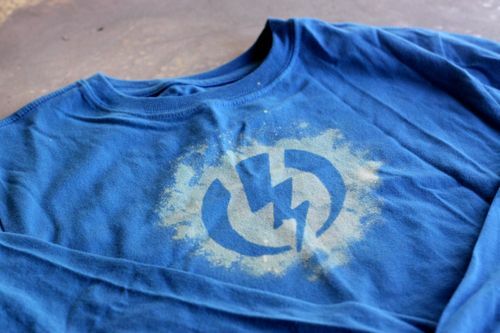 what font is the Percy Jackson tee in? 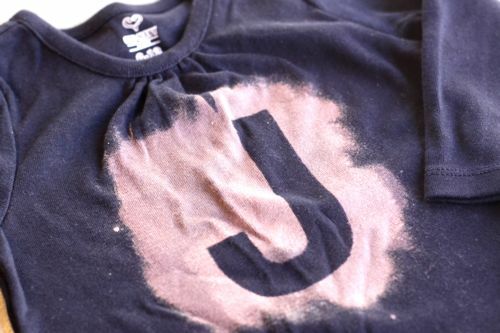 I have made some of these bleached t’s! I’m on my third shirt and now I’m using some cool tribal animal prints to make some for my boys! It’s quite addicting! I am having issues with the bleach going under the letters, even though they are firmly stuck to the fabric…any hints or suggestions? Hi, I love your tutorial! It’s descriptive and the best one I’ve seen! I was wondering if this would work if i made a stencil and put the bleach in a spray bottle? I did these and used White Glue as my stencil for the words….works really well and washes out very nicely. Awesome way to personalise our Girl Scout Troop shirts. does it work with yellow? I know this is an old post, but thank you very much for the idea. I’m a girl scout leader and my troop makes troop t-shirts each year. This is our 5th year and I was running out of ideas (and so done with tie dye and fabric/puffy paint. This is fabulous new option! what if you use paper or cardboard? Do you know if non-chlorine bleach would work in the same way? I would love to borrow your ideas for our Library summer kids’ blog, either paraphrasing or reblogging. Is that okay with you?